Why shop SMO? Members always get 10% off of regularly priced Science Shop purchases, and shopping SMO is shopping local! Every purchase supports the programs and exhibits at Science Museum Oklahoma. 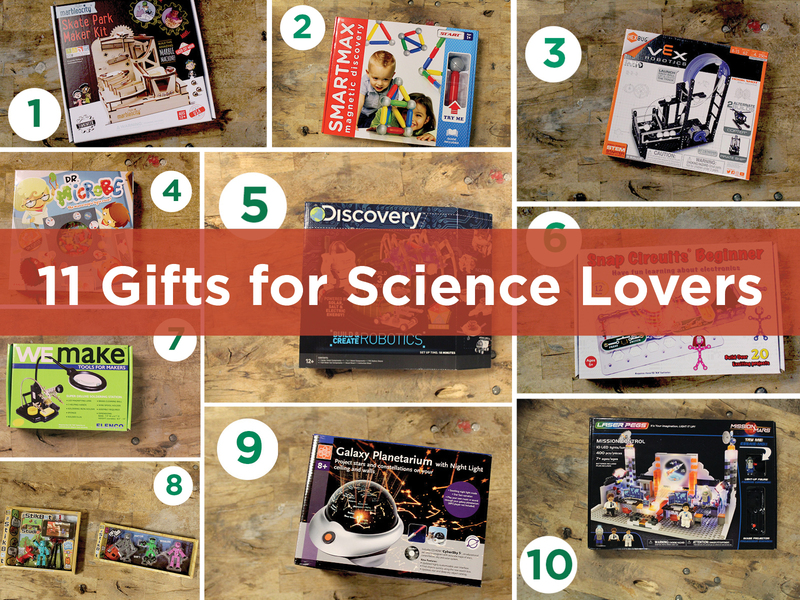 Offering gifts for everyone on your list, even last-minute purchases are easy to find — stop by for help finding the perfect gift for a science lover of any age. Budding engineer or physicist at home? Marbleocity kits introduce the principles of engineering and physics while kids and kids at heart have hands-on fun building a skate park or a roller coaster! Science is for babies! SmartMax is all about magnetic discovery. The colorful, oversized parts allow children ages 1+ to explore the magic of magnetism as they connect, build, and break — all in a safe way! You shoot, you score! Build a kinetic art mechanism that blends the intrigue of machinery with excitement of sports science. Once built, spin the hand crank to wind up the elastic powered striker arm to launch balls through the loop system and sink them in the return basket. Help Dr. Microbe complete her research! Using tweezers, a Petri dish, and the colorful microbes, players race their fellow scientists to figure out which microbes are missing. The fastest scientist wins! Ready to build? The Discovery Robotics kit includes parts for three unique robots that can be powered by solar, salt, or electric energy. Build a spider robot that runs on electricity, a robot that transforms seven different ways and is powered by the sun, and build a car that runs on salt water! Snap Circuits make learning electronics easy and fun while teaching skills like problem solving and following directions. The Beginner kit includes 14 parts that build more than 20 projects. Everything you need to get a young maker started - the WEmake Soldering Station Kit includes an LED magnifying lens, “helping hands,” soldering iron and holder, a sponge, lead-free solder and a spool holder, and a brass cleaning ball. What will your maker create? Create, animate, and share your own stop-motion videos. Budding cinematographers young and old can create stop motion animations right at home! You love the Kirkpatrick Planetarium, but you can’t take it home with you – take this instead! Turn a bedroom into the night sky as stars and constellations are projected on your ceiling and walls. Head for the stars and onto Mars with this classic building set! Prepare astronauts for space in the training and research labs, and then command the action while watching as a film projector brings it all to life on the display screen! Give the gift of SMO! A SMO gift card can be redeemed for an annual museum membership, camps, Late Nite Lab or SMO 21 tickets, purchases in The Science Shop and more! Buy one online here. Don’t see the amount you want? Call Guest Relations at (405) 602-3760.